It's been a while since I heard a new band that played some outright rock-n-roll. Enter Massachusetts natives Seemless and their self-titled debut. 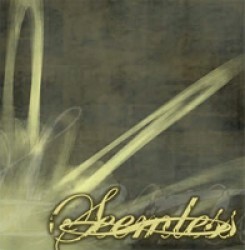 Seemless, is a supergroup comprised of former members of metalcore stalwarts Killswitch Engage, Shadows Fall, Overcast and Medium. Ironically for fans of those previous efforts, they may be disappointed to find an album filled with a balanced mix of hard edged rock-n-roll and sludgy stoner metal, music that would make Black Sabbath very proud. Following a mellow and elevating introduction track, things are quickly kicked into gear with the heavy hitting drums and the crunching guitars of "Something's Got to Give." Musically, this song would be very fitting as a track on Soundgarden's Badmotorfinger or Clutch's The Elephant Riders. On the vocal end, Jesse David Leach, who handled vocal duties in Killswitch Engage prior to recusing himself, is very impressive in his return to the musical world. Instead of relying on his unrelentless screaming ability, Leach has perfected his harmonic singing voice that was only hinted at during his time with Killswitch Engage. Still, there is a diverse mix of the melodies and crooning reminiscent of Chris Cornell or Serj Tankian and screams from his earlier days. The subsequent track, "The Wanderer" is the most articulate of the sound that characterizes Seemless. The excellent guitar work of Pete Cortese could easily land its way onto a Queens of the Stone Age record. On "Soft Spoken Sanity" we are further exposed to his technique and skill with an outstanding guitar solo. While the later part of the album is filled with strong songwriting, the middle of the album becomes a bit stagnant. Tracks like "Endless," "The Crisis" and Lay My Burden Down" fail to develop from initial momentum into anything substantial. The drumming throughout is very proficient providing excellent song structure and great fills, while the bass playing is mediocre, rarely showcasing any hint of skill. Luckily, the album closes out on a high note as "In My Time of Need" delivers an first-rate tribute to the influences that made Seemless possible. Rock-n-roll is on an upswing and making a definitive comeback. If Seemless is hoping to cash in on the recent resurgence, they have supplied consumers with a great product. While the album does contain some choice cuts, as a whole it can be a bit rough at times. Regardless, Seemless have put together a dynamic and energetic debut effort that showcases that they will have a bright future in the years to come. Posted March 23, 2004, 4 p.m.